Today, let's make the tour a bit shorter. 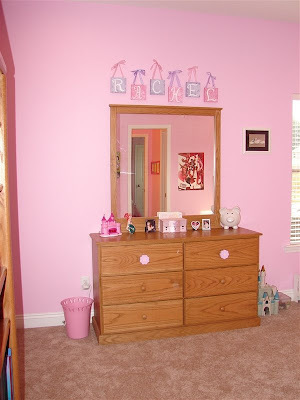 I wanted to put the girls rooms and bathroom together, but there were just too many pictures. I've done a few really long posts, so I'm just going to break it up into three. One for each bedroom and one for their bathroom. So, let's get started with Rachel's bedroom! Here is a look as you walk in her door. You can see her dresser. You can see in the reflection the door to the bathroom! Move a little to the left and you can see her window and the end of her bed. Her window looks out to the driveway and on out to the cul-de-sac. We also have our trash cans right in front of her window. 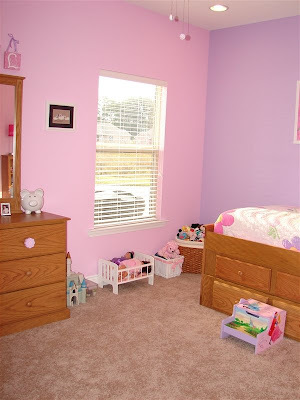 She has two of her walls painted pink and two walls painted purple. Here is a view of her bed. 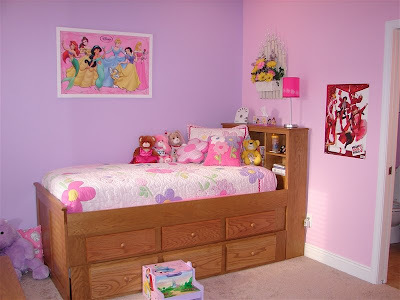 We had the bed made for her when I was pregnant with Rebekah. It is made from solid oak. I love that it has the bookshelves as the headboard. The top three drawers going across the middle are actual drawers. Gives a lot of storage space! The bottom three drawers going across are fake, the entire bottom part pulls out and has another mattress...it's a trundle! The dresser was made by the same people. The trundle came in handy at the apartment...that is where Rebekah slept. The bed is quite high off the ground though, so both of the girls use the stool to get up there! Here is a view while standing in front of the window. 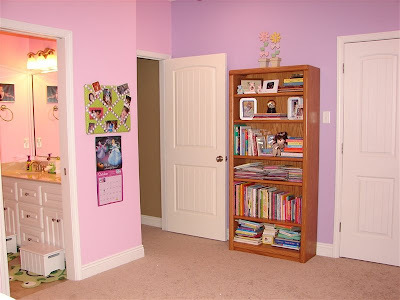 You can see back to the door and her closet doors are there on the right. She has two doors that open to her closet. You can also see into the bathroom there on the left. 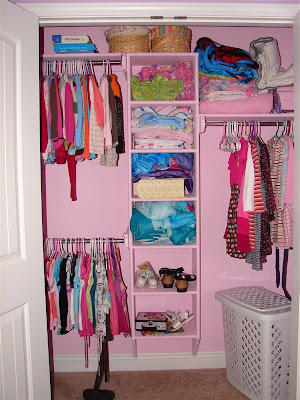 And let's take a look inside Rachel's closet. She has the largest closet in the three extra bedrooms. She had room in hers for the shelves coming down the middle. And last, standing in front of the dresser you can see straight through the jack-n-jill bathroom. Look even further and you get a sneak peak into Rebekah's bedroom. 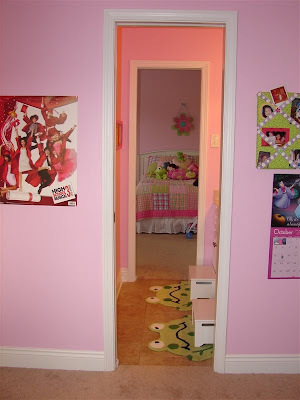 You can also see in her bedroom where some of the High School Musical stuff has started to creep in. She still likes princesses, but is broadening her options! Which by the way, we did take her to see High School Musical 3 on opening day. She liked it, but I think there was still stuff that she didn't quite get. And I must say, I'm glad she didn't get it all. I still want to keep her young and innocent for as long as I can! Tomorrow we'll tour through the bathroom! See you soon! Aww! I love her room! And, the storage under the bed must be great to have! !